Brands that have signed up include The Guardian and Global. Snapchat is ramping up its online TV proposition in the UK after snaring 17 media brands to launch content on its new Shows platform, which will include non-skippable ads. Shows, the messaging platform that rivals YouTube, will feature 25 new series in the UK. Brands will be able to advertise against six-second non-skippable ads via Snapchat’s self-serve Commercials format. It is the first significant step taken by parent company Snap, whose ad revenue has depended on skippable ads, to grow and monetise TV-style content in the UK. Snap launched the first Show in the US in June, a serialised docu-series called Endless Summer. Sky Sports and Vice have already been producing content for the platform’s publisher channel, Discover, but new brands that have joined include The Guardian, Channel 4 (on a trial basis) and Global. The shows expand the selection of local content available on Discover, which already features "publisher stories" from well-known UK brands including the Telegraph and The Economist. Discover launched in 2015 with 18 brand partners and today Snapchat said that number has grown to more than 100 globally. The Guardian, for example, is launching Fake or For Real, a show that challenges viewers on their preconceptions about current news. Video will be produced for mobile devices held in vertical mode and each show will average five minutes in length. 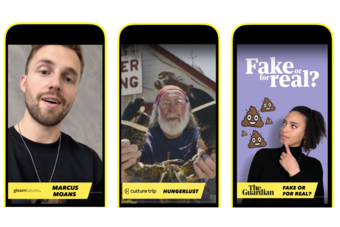 Not all content on Shows is guaranteed to be brand new; earlier this month, Snap launched Snapchat Originals for content that debuts exclusively on the social platform. Time spent watching Shows on Snapchat has tripled since the beginning of the year globally, with 21 unique Shows in Discover reaching a monthly active audience of more than 10 million globally during the third quarter of this year. Rami Saad, head of international content partnerships at Snap, said: "Our priority is to provide Snapchatters with a personalised experience that features a diverse mix of credible, local voices alongside some of the best content creators from around the world. We are also excited to help our partners build their brand with a highly engaged, global audience."